Automated External Defibrillator training is quickly becoming common in the workplace. Heart disease is one of the main causes of death in the UK. In event of someone collapsing following a heart attack, they may be in cardiac arrest in which case time is life. The quicker this person receives a controlled electrical shock the higher their chances of survival. More and more workplaces are starting to include Automated External Defibrillator [AED] training in the first aid training for their staff. United Kingdom Resuscitation Council guidelines emphasis the importance of early defibrillation as part of the chain of survival in victims of cardiac arrest. Whilst AEDs are becoming simpler the additional confidence from AED training can result in workplace first aiders being able to administer a shock quicker than those untrained in the use of an AED. We pride ourselves on listening to the exact needs of our clients when we discuss automated external defibrillator training, adapting our training to reflect their specific needs. All our training reflects our belief that “first aid training is a contact sport” so delegates will get plenty of “hands on” and the chance to practice their skills. 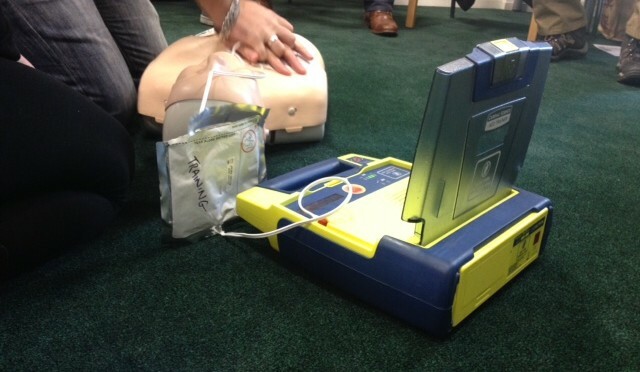 Our AED training courses are always adapted to reflect the needs of each organisation, the existing level of training for its first aiders, in house policies and practices and the equipment available to the first aider. Our training focuses on the practical application of AED and first aid skills and reflects any relevant in house AED and first aid equipment and policies. Lazarus Training provides AED training aimed solely at helping your first aiders provide quick and confident first aid assistance in event of a cardiac emergency. 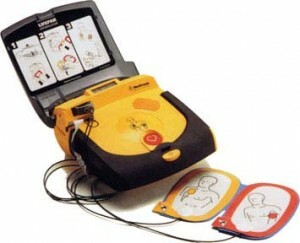 AED training can be run with First Aid at Work or Emergency First Aid at Work training courses. Call 0800 242 5210 or email us on info@lazarustraining.co.uk to discuss your needs.